The difference between a professional construction team, and an amateur ‘weekend warrior’ is obvious. Detail. Consider the photo depicted in figure 1. When there’s limited access to install a back patio or walkway, sometimes the only solution is a straight line. The straight line can lead right through the front and rear exits of the home. When Genesis consults on a project, access represents a key concern. Pricing and the time-table of the project depend heavily on the distance between crew vehicles and supplies and the paved area. Our goal is to get your home back to 110% as soon as possible, and sometimes this means unconventional measures. [Figure 1] This project required special access through the home to reach a back patio. In figure 1 left, the crew’s only access leads right through the home. To protect against damage and dirt, Genesis developed a specific technique for through-the-home access. In figure 1, notice the tarp covering the floor, nearby cabinets, and furniture. This ensures not dirt, dust, or pebbles touch the residence. Temporary plywood flooring above the tarp further protects from grime and scratches. 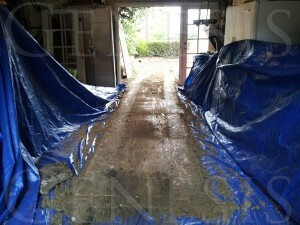 Upon project completion, the crew rolls up the tarp and reveals the spotless condition of the pathway. It’s like Genesis was never even there, except for the beautiful new outdoor feature that neighbors will envy for years to come. This writer recommends inviting the neighbors over to gloat, I mean dinner. For all your outdoor remodeling visions, contact Genesis today. Many members of our design team have been with us for 15 years or more, so we have the experience needed to raise your expectations of your property. Allow us to surprise you. For a free estimate, call toll free 888.389.5533 or visit our free estimate page.